Blushed like a fuzzy sunset, peaches arrive just in time for the height of summer, ready to be slurped up (juice-trickling down the chin and all) or strewn through an array of fresh dishes. With their balanced acidity and sweetness, they are excellent in classic desserts like peach cobbler or peach Melba. Tangy peaches work excellently in savory dishes and pair particularly well with proteins—experiment with our new recipes, a twist on the Caprese salad and pork carnitas tacos with a zesty peach salsa. Here’s all you need to know to make the most of peach season, from how to pick the perfect peach to how to gracefully cut it, plus our new peach recipes to make this summer. Peaches are stone fruits that are said to have been cultivated as early as 2000 – 6000 BCE in northwest China. They eventually made their way to Europe via Persia (modern-day Iran), hence their Latin name, Prunus persica. 2. What’s the difference between nectarines and peaches? If you’ve ever confused a peach for a nectarine, here’s your redemption: Peaches and nectarines are in fact the same species, and are both key pillars of the stone fruit family. The only large difference is that nectarines have smooth skins (thanks to a genetic mutation), unlike their fuzzy peach counterparts. Given their similarities, you can use them pretty much interchangeably for peaches in most recipes. Should you need more convincing—like most things grown on a tree—there’s a good deal of nutritional value in peaches to boot. Beyond the obvious two, fiber for healthy digestion and carbohydrates to give you essential energy to get through your day, peaches are an excellent source of vitamins A and C. A good sized peach gives you approx. 10% of your recommended daily intake of immune-boosting vitamin C and in the region of 20% of your recommended daily intake of vitamin A which aids vision. Peaches also contain potassium which is essential for cardiovascular function and for the nerves, kidneys and muscles. Yellow peaches: This is your classic peach: fuzzy on the outside, sunshine yellow on the inside. With their firm flesh, they are more suited to being grilled or baked, as opposed to softer white peaches. As they are also higher in acidity, they are the superior peach for cheese or meat pairing with their sweet and sour contrast. 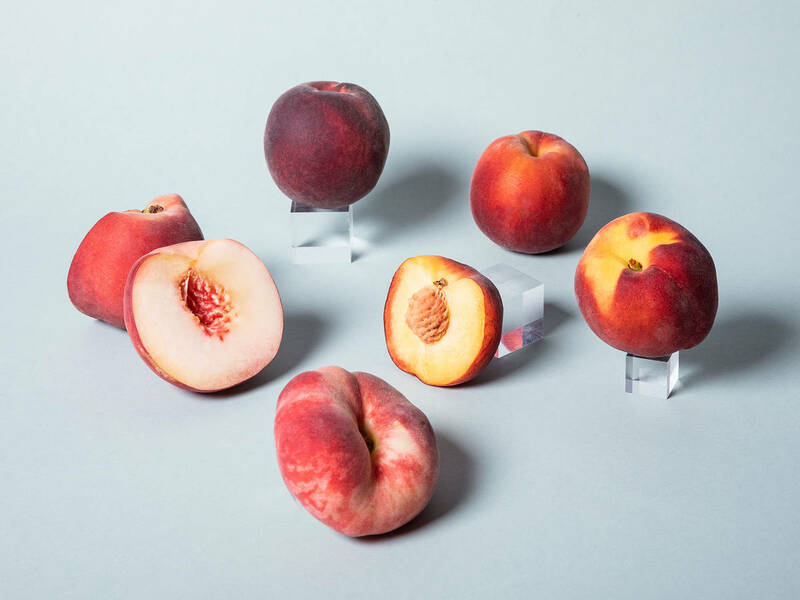 White peaches: Though they look similar, or even sometimes identical to yellow peaches on the outside, white peaches are less sour and often more fragrant than the yellow variety with a softer texture and milder bite. They are excellent dropped into sparkling wine like Prosecco for a summery aperitif—as demonstrated in one of our favorite cookbooks of 2018 (so far), the prolific Diana Henry’s How to eat a peach. Donut peaches: Also known as flat- or Saturn peaches, this variety tastes more like a white peach though they’re often even lower in acidity. They are best eaten as is! When looking for peaches, take a whiff. Can you smell the tell-tale peachy fragrance? That’s your first sign of a good peach. Next, check that the skin is smooth and taut—any bruising or wrinkling means it may already be overripe or have been badly damaged in transit. Finally, does it have some weight to it? Yes? Then here’s your juiciest, freshest peach. Enjoy! Peaches ripen quickly once plucked from the tree, meaning they often make it to market within a week or so after harvest. It’s worth noting that peaches picked out of season, or before their prime, will never ripen properly—or give off that fragrant peachy scent. To avoid bruising ripe peaches, try to keep them stored in a single layer. Like all fruit and vegetables, they need to breathe, so don’t keep them in sealed plastic containers or bags. If ripening peaches is your aim, keep them covered and at room temperature—summertime fruit flies flock to peaches like, er, moths to a flame, so make use of a mesh food cover or light kitchen towel. Ended up with wrinkled, bruised, or simply overripe peaches? All is not lost. Make a peach syrup by boiling up water, sugar, and the peaches. Then strain it into black tea to make a refreshing peach iced tea. Peaches are a notoriously fickle fruit to prepare—too ripe and they’ll bruise when handled, not ripe enough and the stone will prove difficult to pry out. Freestone peaches will be easier to work with than clingstone peaches, as the flesh comes away from the stone more easily.